A lot has been discussed about how to save and revive the Cherokee language. These are all helpful tools to use along with reviving the language, but they are NOT the means for truly reviving and saving it. What will save Cherokee language? The language will be saved when it is used. What is needed are monolingual Cherokee speakers. We need communities full of people dedicated to ONLY speaking Cherokee. Languages DIE when they try to survive by being bi-lingual. In fact, it is a well known fact that even bilingual-ism does not last long unless this city has a regular flow of monolingual speakers from both languages. Just look at the history of America and 3rd generation immigrants. but their grandchildren became English only speakers. To gauge how healthy, how strong a language really is, we need to look at the percentage of the young people between 16 and 30 who speak it exclusively and who speak it daily. Older speakers don't truly contribute to the continuance of the language because they are not raising their young families. They can be a resource, but they are no longer the source. 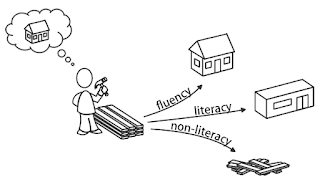 Research has shown us that even a fluent native child when taken into the environment of another dominant language and ceases to use their child hood language will forget every word of their native fluency to the point of their own language even sounding foreign to them. Younger speakers don't count because that language can be over written if not consistently kept up until the teen and young adult years. They may even speak it daily in school or even speak it at home. But if they are out of school, their minority language will all too often never be spoken unless maybe in brief visits at home. So, yes, ages 16-30 must be FLUENT speakers. Until communities commit to establishing fluent, monolingual speakers ages 16-30, a language, even a strong one, withers away and dies. Consider what is happening to indigenous languages all over the world. Study what is happening to Irish. Read about the struggle of native american languages. There is ONLY one language that dropped to fewer than 300 speakers that was revived. There were very few real speakers. But there was a desire to save the Hebrew language. So, a commitment was made to monolingual-ism. This was a HUGE sacrifice for the parents that embarked on their mono-lingual commitment. They lost the ability to communicate well with their own children. But they knew it was worth it. They knew it was important. They willingly made the sacrifice. They married one another and created more monolingual families. Today, there are some bilingual speakers of Hebrew, but there are thriving communities of mono-lingual Hebrew speakers. This is the commitment that is required if Cherokee language is going to not just survive, but thrive. This will be what saves the Cherokee Language. It will be revived when it is spoken. So, no, Children speakers under age 16 don't contribute to the health of a language. Obviously, they are needed to "grow up" into the 16-30-somethings that speak. But they are not the be-all and end-all for planning a revival of language. It is not the children. Not the second language learners. But FLUENT monolingual speakers if the language is to TRULY be a "Living" language. The ones that survive are the ones that have a community of ages 16-30 that are monolingual, fluent speakers. you must actually go to youtube to view the video. To do that, click the "PLAY" arrow in the middle below, THEN click in the lower right corner where it says YOUTUBE then it should allow you to play it there. 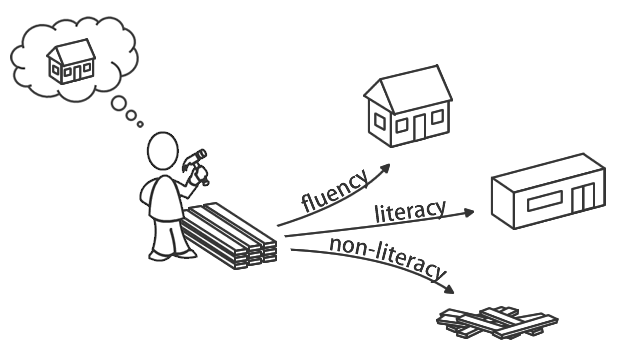 But-- how do we learn to read? Many, many friends have tried this and told me THIS WORKS! they watch specific videos we have posted on YOUTUBE. we decided to SHARE that specific set of videos (minus 2 that are only available to workshop participants) with EVERYONE who watches YOUTUBE. So- you may not have the seminar or the song but you CAN write out the syllabary using a chart. -- in addition to using your flashcards and writing out the syllabary as you say the pronunciations-- every day-- and you WILL learn to read. Join this with our workshop we offer and you will become literate in Sequoyan Syllabary. Contact Cherokee Bible Project to set up a workshop for your group. Eastern dialect does not use the Ꮬ-Ꮭ/Ꮮ/Ꮯ/Ꮰ/Ꮱ/Ꮲ tla/tle/tli/tlo/tlu/tlv line and instead replaces the old words with those spellings with Ꮳ/Ꮴ/Ꮵ/Ꮶ/Ꮷ/Ꮸ tsa/tse/tsi/tso/tsu/tsv. The New Testament uses the western spelling (also the "Tennessee Dialect") for those words but the Big Covers use the old eastern dialect. Comparing in this way may help you to use more resources in your language learning. Written documents- no matter which document- become easier to use in the dialect YOU have chosen to study/use when you know this little "trick" for swapping out the spelling/pronunciation. Just be careful of the words that the Seminary years changed their spelling and you will be fine (you can look at the original Gritt's list and see what those words are). Having more written resources to study and learn from can only be beneficial to all of us as students. So don't let a documents use/choice of dialect stop you from learning from it. You now know an important way to adjust for the dialect you wish to learn and use. Someone contacted us and as a reminder, requested a re-post of the link to the Bilingual Cherokee/Spanish website. And of course, we always need volunteers for this project and others. simply select the website page you wish to work on. Copy the URL of that page onto wordpad or notepad and also copy the website selection's information to wordpad or notepad and compare the words to an original source document such as a printed Cherokee Bible and either a KJV English Bible or, in the case of the Spanish page, the Reina-Valera (1960). You can find those online at Biblegateway. Once you have copied the website selection onto notepad or wordpad, make corrections that are needed. help us to know which -of any-- corrections needed with a highlighted text color and copy that text into an email and send to our email address along with a copy of the URL of that particular page you are making corrections to for us. A cancellation has opened up a place in our summer schedule. July 20 & 21 are available for a 2 day language & culture seminar. --If you have never held one of our seminars, we suggest the first of the series which is a 2 day course is designed to set Cherokee Second Language Learners on the right path for success in speaking. --If you have participated in one of our introductory seminars, we now offer a second seminar that brings the speaker further into the language as well as provides necessary instruction for participants to begin teaching others. The suggested minimum donation for this 2 day seminar is $800 and a request for additional provided lodging, meals and travel costs. (lodging and meals are requested for the evening prior and throughout the seminar). This will generally be for one person and no more than 2 of our staff volunteers will ever be presenting. We generally receive more for a 2 day seminar, but since a non-refundable deposit accompanied this time slot, we are offering this for the remaining amount, which may make it more affordable for your group this year. Contact us for more information if you are interested in scheduling this time for your own. That time does not fit your group's schedule? We still have some unfilled summer timeslots left --but not very many. Adsense complained my blog has too much Cherokee! Google believes my blog is PRIMARILY in the CHEROKEE language rather than in English. Sadly, most of my blog is in English. I have explained that my blog does explain Cherokee language but is primarily in ENGLISH. I may need to find another venue once they are done reviewing my posts. I will notify everyone if I need to switch, when /if that happens. PS-- apparently, google thought my blog was actually in some arabic language but we are trying to straighten this out. 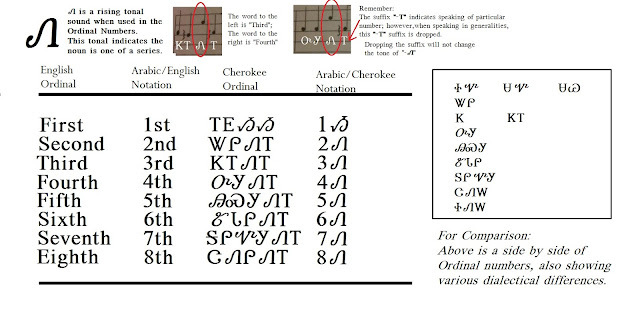 Have you wondered about making abbreviations in Cherokee? What? No one told you that Cherokee HAS abbreviations? I don't know about you, but learning ordinals in English took a minute or two to wrap my head around. Remember, we learned these in Kindergarten/ First grade, which means they are so easy for us now we may have forgotten that struggle, but believe me, it was a "thing" for most young scholars. "-st", "-rd", and "-th" a tough concept to navigate. But they are not so important in English that you couldn't just leave them off and be understood. Cherokee is NOT that way. You must NOT leave these out. In Cherokee, Ordinals are more important than they are in English. What I want to stress today is how to notate the ordinal in Cherokee. I find that the system of switching from writing it out is much easier in Cherokee than it is in English. In Cherokee, most writers/speakers use the Arabic number followed by either "-Ᏹ" or "-Ꮑ". Just learn to say the Cherokee Ordinal number correctly in your dialect of Cherokee and add either "-Ᏹ" or "-Ꮑ". Here's a hint: only 1st (or 1) uses the "-Ᏹ " ! 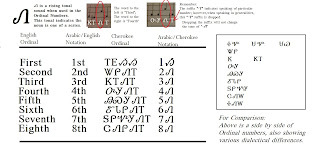 now that you know HOW to use them, how about from now on, replacing all your English ordinal notations with Cherokee ordinal notation?